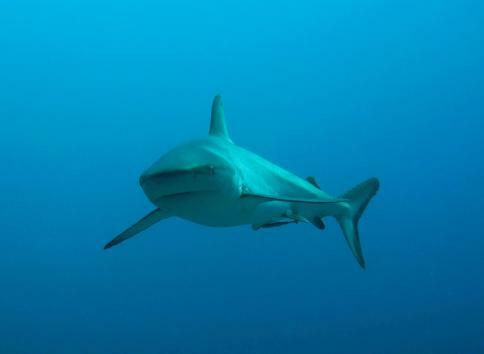 Researchers from the Wildlife Conservation Society and the University of Western Australia have found that Fiji’s largest marine reserve contains more sharks than surrounding areas that allow fishing, evidence that marine protected areas can be good for sharks. In a study of the no-take reserve’s shark populations, the researchers found that the number of sharks in Namena Reserve — located on the southern coast of Fiji’s Vanua Levu Island — is two to four times greater than in adjacent areas where fishing is permitted. The study appears in a recent edition of the journal Coral Reefs. The authors include: Jordan Goetze of the Wildlife Conservation Society and the University of Western Australia; and Laura Fullwood of the University of Western Australia. The researchers conducted their study during a three-week period (July 4-28) in 2009 in Namena, a 60-square-kilometer reserve established in 1997 and managed by local communities. In order to survey the sharks, Goetze and the WCS Fiji team used stereo baited remote underwater video systems to record data at eight sites within the reserve and eight outside the reserve at both shallow and deeper depths (between 5-8 meters, and 25-30 meters respectively). “The study not only provides evidence that Fiji’s largest marine reserve benefits reef sharks, but achieves this in a non-destructive manner using novel stereo video technology,” said Goetze, the lead author of the paper. The 60-minute video segments taken captured images of five different species of reef shark, providing the researchers with data on shark abundance. In addition, Goetze and the research team also were able to estimate the length and size of the sharks whenever the animals were within eight meters of the camera, enabling them to generate estimates on biomass for Namena Reserve. Outside the reserve, in areas where fishing is permitted, the researchers found fewer sharks. The researchers note that, because local Fiji communities traditionally considered sharks to be sacred, eating them is typically taboo. The most likely driver of higher shark densities within the reserve, assert the authors, is the significantly higher availability of prey fish that WCS researchers have found within the reserve boundaries compared with adjacent areas. As demand for shark products grows, higher prices are driving some locals to catch sharks, while Fiji shark populations are also vulnerable to foreign fishing fleets. Worldwide, increasing rates of harvesting are leading to the depletion of many of the world’s shark species. The study was made possible by the generous support of the David and Lucile Packard Foundation, the Gordon and Betty Moore Foundation, the Stavros Niarchos Foundation, and the University of Western Australia (UWA) Marine Science Honours program.